Home › Press and Insight › Want to read The Sunday Times’ guide to successfully recruiting and interviewing candidates? The Sunday Times commissioned Talentspace to write a book on Successful Interviewing and Recruitment. The first edition of the book came out in 2008 but was successful enough to warrant a second edition which was published in 2010. “Dr Yeung’s book walks you through the minefield of interviewing and selection. By following his rigorously researched path, you will be equipped to select the best candidate for the job. An invaluable read!” – Nicola Forristal, Human Resources Director, Bartle Bogle Hegarty. 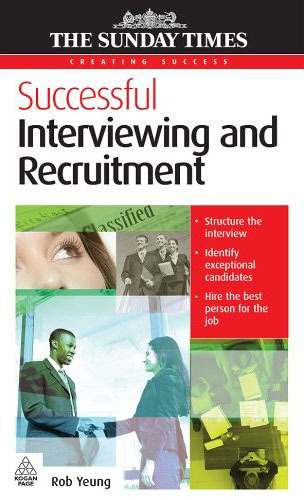 “Packed with practical suggestions on how to prepare for and conduct structured interviews. A must-read for all executives who want to enhance their interviewing skills.” – John Curricat, Talent Assessment Manager, HSBC. “Written with clarity and insightfulness, Dr Yeung’s book provides practical examples of how to get the best out of every interview, whatever your level or experience. This book has fast become my interviewing bible.” – Carol-Ann White, HR Director at LEWIS Public Relations. Please click on the book cover image above to read more about the book on Amazon’s website (link opens in new window). To find out more about the Talentspace approach to assessment and candidate selection, please contact us.